Frankie Edgar is almost impossible to dislike. The fighter is the epitome of heart, rarely ever coming out of a fight on the losing side and normally covered in blood, an equal amount of his and his opponent’s blood typically. The New Jersey native is a gritty wrestler with some of the most underrated boxing and head-movement in MMA today, utilizing crisp clean combinations and a crushing pace to wear his opponents down and drag them into the deep waters. A former Lightweight champion, Edgar seemingly defied all odds in his title rain in the 155 lb division, he defeated the legendary BJ Penn twice, and went on to engage Gray “The Bully” Maynard in one of the most exciting trilogies in the history of combat sports. In spite of cutting no weight to meet the lightweight limit (he naturally weighs between 150-160 pounds), Edgar took on Maynard (who has allegedly walked around close to 200 pounds in his off-season) and despite nearly being knocked out in the first round of the second and third fights, ended up winning the trilogy after a stunning late knockout of Maynard in a Fight of the Year candidate. However, two contentious split-decision losses to Benson Henderson prompted Edgar to finally give in, cut a couple pounds, and challenge Feathweight kingpin Jose Aldo for the title, in a battle that Edgar narrowly lost, in spite of a noticeable size advantage. Additionally in that fight, Edgar seemed to clearly win the last rounds of the fight, and began to show holes in the game of Aldo, who previously had seemed bulletproof. Still a featherweight, “The Answer” has smashed any and all opponents not named Jose Aldo on an absolute tear back to the top of the division. However, the emergence of a brash Irish phenom led to Edgar being forced to take a back seat on his road toward title contention, as the “Notorious” Conor McGregor’s fame and knockout power helped him lead over Edgar towards a shot at Aldo. Now, Edgar will compete in what is arguably, one of his toughest opponent’s to date, with the opportunity to face the winner of Aldo vs. McGregor for the unified Featherweight strap. Edgar faces bruising wrestler Chard Mendes, Jose Aldo’s greatest rival until McGregor, in a #1 contender’s match, and the typically humble Edgar has finally let loose. In recent interviews, Edgar has claimed that the UFC didn’t want him to step up as a late replacement for Aldo and McGregor several months ago, when Aldo was forced to withdraw from the fight with broken ribs suffered in training. The UFC again chose to ignore Edgar, offering the fight on two-weeks’ notice to Mendes, who was fresh off of a Fight of the Night defeat to Aldo in his last bout. However, Edgar claims that Mendes was chosen less for credentials, and more because of his poor physical conditioning, as Mendes was on a hunting trip and not in the gym when he got the call. Edgar believes that Mendes was a safer bet for McGregor to battle for the interim title, as a result of McGregor’s relatively untested ground-game, so that the UFC could provide a good name opponent for McGregor, who he would likely defeat, to keep him on his collision course with Aldo. McGregor would go on to be dominated in the first round by the powerful Mendes, but a short camp for the late-replacement would lead to him gassing late in the second round, and being knocked out by the Irish striker in the last seconds of the fight…a result Edgar says would have been drastically different had he been the replacement. But Is Edgar Really The “Answer” ? Both Aldo and McGregor have holes in their game that have been made obvious throughout their careers, and both of those shortcomings seem to play right into Edgar’s hands. A massive featherweight, Aldo has shown a very small gas-tank in championship bouts, visibly slowing down in the later rounds against Kenny Florian, Mark Homenick and Mendes (in the second fight). However, Aldo is typically so dominant in the earlier rounds, he is able to coast a bit as he gets tired and ensure a victory by decision if he can’t get a knockout. 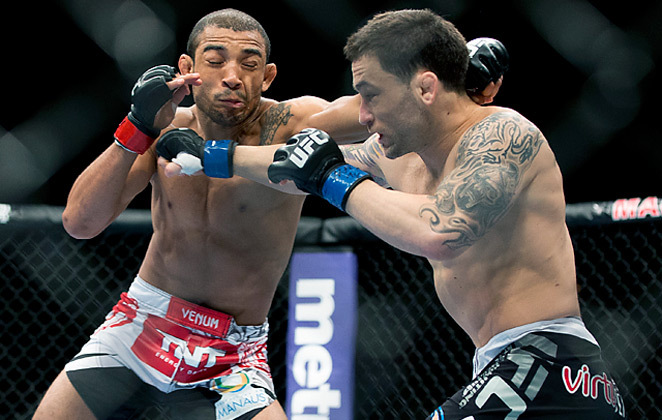 When Edgar battled Aldo, he was battered by the Brazilian’s famous leg kicks and straight punches in the opening round, but a superhuman chin kept Edgar in the game, and as the rounds went on, Edgar pushed the pace more and more, tagging Aldo with some big shots and showing that sometimes, sheer will can keep a person competitive. Aldo cuts an enormous amount of weight, Edgar cuts very little, so the cadio aspect of the fight is clearly in Edgar’s favor. If Edgar can avoid those baseball-bat leg kicks and score more takedowns early, where his ground and pound and relentless submission game are most effective, Aldo could be in for a long night. Additionally, Edgar’s boxing improves rapidly with each outing, and his mobility is truly a strong-suit, more movement against the more stationary Aldo could be a real game-changer moving forward. Assuming McGregor defeats Aldo (which is a big “if” that I will discuss in the coming weeks), in my very humble opinion, he will be chewed up and spit out by the gritty American. McGregor was thoroughly embarrassed by Mendes on the mat, and hopelessly outgunned when a real aggressive wrestler was on top of him. Takedown defense has always been a question mark for McGregor, who historically has knocked out his opponents before they have the chance to shoot. However, after Dennis Siver was able to drag McGregor to the mat, and Mendes showed how dominant wrestling could be against the Irish phenom, it’s hard to believe that Edgar wouldn’t have the same success. Once that fight hits the mat, Edgar becomes the energizer bunny, punching, elbowing, transitioning and hunting for submissions without missing a beat. Here, I believe that Edgar will grind McGregor down before finishing him with a submission. The way to defeat both Aldo and McGregor, is to pair them against someone with fluid and respectable striking, enough to force them to keep their guard up, but blends their wrestling into their boxing combinations well. Edgar is a master at transitioning from kickboxing to wrestling and back, which forces strikers like McGregor and Aldo, who rely on kicks, to be more tentative and find alternative ways to create distance to strike. But Will Edgar Make it Past Mendes? Mendes, stylistically, is the toughest match-up for Edgar in the division. Mendes with a full camp is very strong, in excellent condition, and may hit as hard (if not harder) than Aldo and McGregor. However, I see the fight playing out similar to Edgar’s trilogy with Maynard. A ferocious starter, Mendes will likely come out guns blazing against Frankie, throwing that missile of a right hand early and often. Edgar can expect to get tagged, but so far, his legendary chin has held up to some of the hardest hitters in the world. Wrestling-wise, in the early rounds, I’d expect a stalemate, as the clash of wrestling styles would likely negate each other. Like all Edgar fights, however, the length of the fight is an enormous factor. As the bulkier Mendes tires, I expect Edgar’s crisp punching to land more and more, increasingly effectively and ultimately, turning into Edgar takedowns and ground and pound. I predict a Unanimous Decision win for Edgar over Mendes at their fight on December 11th, and a chance at the crown with a strong performance. From there, if MMA’s Rocky Balboa can implement the advancements we’ve seen from him recently, the Featherweight Division could have a new Sherriff in town. 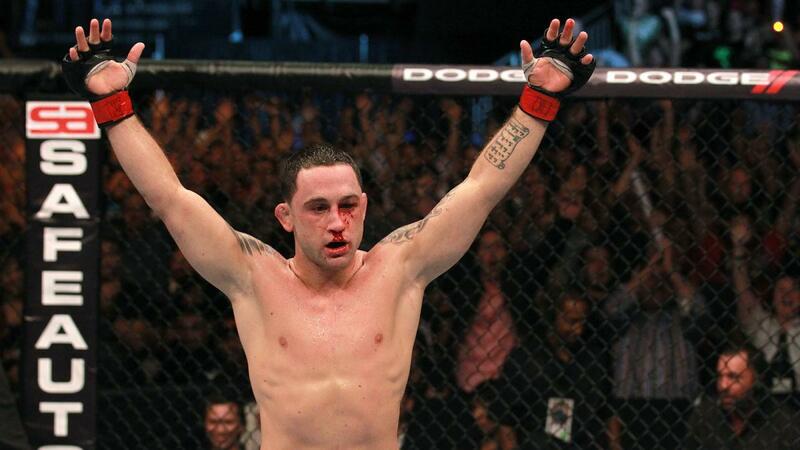 Frankie Edgar just might be “The Answer” to the Aldo/McGregor riddle. Next Article » HBT’s NFL Pulse Check: MIDSEASON AWARDS EDITION!!!!!!!!!! !